One of the home decor projects I’ve been putting off for a long time was the framing out of our kitchen entryway. I wanted it to look rustic and artsy. The entryway is wide and awkwardly angled. My fear was that it would be tricky to get the right angles on the wood beams, and besides, I couldn’t see handling the weight of the sized beams I really wanted. Fortunately, I bartered with Bob the fix-it-up chappie to use his manly strength on this project in exchange for some office work. To my delight, I found the perfect 6 inch x 6 inch by 14 foot weathered wood beam at Habitat for Humanity for $21. 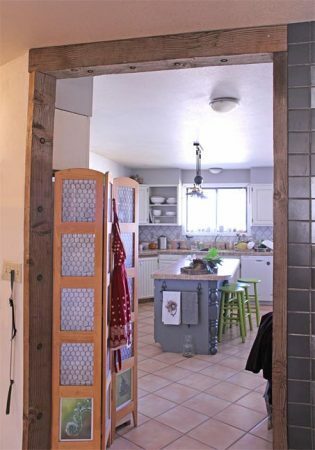 Bob bought 12 hex bolts and washers which he soaked in acid to give them a rusty look, and with the help of his assistant, installed the door frame in about four hours. 1. 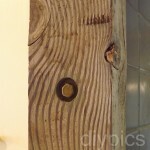 Measure the top of the door frame and cut a piece of 6″ x 6″ weathered lumber to fit. 2. 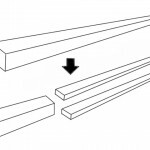 Measure the height of the door frame and subtract the 6 inches (or 5 1/2) for the top beam. Rip a piece of 6″ x 6″ lumber in two to fit the height of the doorway. One piece will go on each side. 3. Drill holes in the beams the size of the hex bolt washers and the depth of the hex bolt head. This will allow the hex bolts to sit inside the beams rather than stick out. 4. Stand the side beams against the door frame and drill holes for the hex bolts right through the beams and into the wall. Attach the side beams to the door frame with hex bolts. 5. Drill holes in the head piece (transom) for the hex bolts and washers. Slide the head beam over the two side beams and bolt in place. Note: the bolts in the head piece do not have to make contact with any ceiling joists. They can be merely decorative. The door way looks great! Super chic and rustic. That was a great idea on making the bolts look old and worn as well!